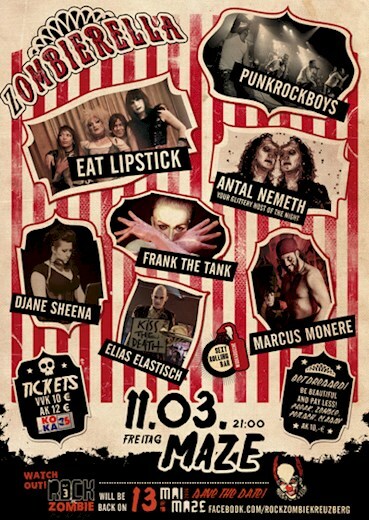 This event "Zombierella - Eat Lipstick, Punk Rock Boys u.v.m" @ Maze has already ended on 03/11/2016. Here you can find upcoming events for this location! 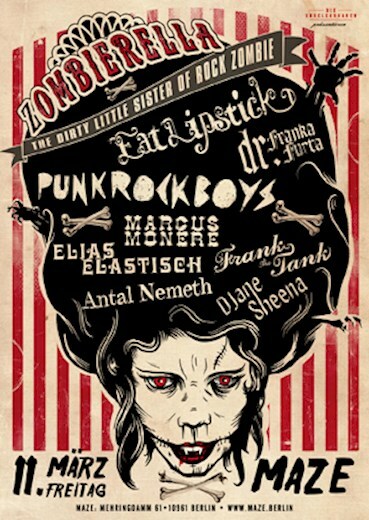 ZOMBIERELLA invites you to her Punk Rock / Glamour / Freak Party! - Steamy Punk Rock Interpretations from Abba to Dead Kennedys- definitily the hottest Boy Group of the Universe! Dr. FRANKA FURTA - King of Metadrag: Drag Show with Dr. Franka Furta- Drag King und Queen - all in one! Frank The Tank - A dancer between the supernatural & the underground. Every move an echo. - Your glittery host of the night ! Be surprised!